There’s something a bit autumnal in the air, don’t you think? The nights are ‘drawing in’, there’s a chill in the early morning air (and believe me, with two small children I know ‘early’ better than most) and the garden, as well as giving up its tomatoes and chillies, is starting to look a bit sad. We’ve already harvested our first blackberries and have been circling the local sloe bushes in anticipation. After a hot summer of salad and barbeques, my mind is turning to different food; I’m craving something more substantial now, casseroles, pies and soup and bread. And so with all this in mind and with a nod to the changing of the season, I hereby nominate Cheddar cheese as the cheese of the month. Cheddar for me is synonymous with cheesy jacket spuds, the comfort food of my childhood, scoffed whilst watching Grange Hill on a chilly evening. Happy days. For myself this month, I’m looking forward to getting to grips with some real farmhouse Cheddar: cloth-bound, cave-aged and covered in rind. There are lots of producers making traditional Cheddar: Keen’s, Montgomery’s, Barber’s and Westcombe in Somerset; Quicke’s in Devon (who also make goat Cheddar); Denhay in Dorset; and the Scottish Isle of Mull. (Any other Cheddar recommendations, cheese-lovers?) And what to do with it? A truly versatile cheese, I’m thinking tarts and pies, scones and biscuits, sauces and sarnies and, of course, lovely squidgy baked spuds. Have a Cheddar recipe in mind? 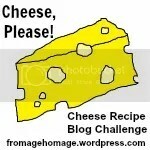 Want to take part in September’s Cheese, Please! Recipe Blog Challenge? Check out the full rules here. Write a recipe post using the featured cheese of the month and post it on your blog. A link to these rules and the Cheese, Please! button (code below) should be included in your post. Post your recipe url to the Linky at the bottom of this post, including your email and the title of your recipe or post. Would love to find out how your homemade town cheese turns out. I’m rather partial to Davidstowe cheddar. Like Stephane, I’d love to know how yours turns out – hugely impressed that you’re giving it a bash. Hi, I tried to enter using the linky but it seems to be broken, let me know when it’s fixed and I will try and link it again!